1. K.P.M.BHAT, L. ANJANEYULU, M.BHATTI : 'A Range Gating Waveform Generator for a ground based S-band Scatterometer', Journal of Armament Studies, IAT, PUNE, 29(1), June 1994, pp 1-13. 2. K.P.M.BHAT, J.B.BHALERAO, L.ANJANEYULU : 'An Average Velocity Display Circuit for Ka-band CW Doppler Radar', IETE Technical Review, Vol. 12, Nos. 5&6, Sept-Dec 1995, pp 383-386. 3. L. Anjaneyulu, N.S. Murthy, N.V.S.N. Sarma., ï¿½?ï¿½ï¿½?Identification of LPI Radar signals by higher order spectra and neural network techniques ï¿½?ï¿½ï¿½?,International Conference on Electronic Design, 2008. ICED 2008, University of Malaysia Perlis, Perlis, 1-3 Dec. 2008. 4. L. Anjaneyulu, N.S. Murthy, N.V.S.N. Sarma., ï¿½?ï¿½ï¿½?A Novel Method for Recognition of Modulation Code of LPI Radar Signals ï¿½?ï¿½ï¿½?,International Journal of Recent Trends in Engineering (IJRTE) (Electrical & Electronics Engg). Pp 176-180, Vol 1, No.3, June 2009. Academic Publishers, Finland . 6. Ch. 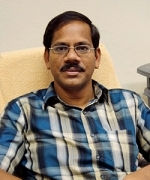 Sulakshana, L. Anjaneyulu, ï¿½?ï¿½ï¿½? A CPW Fed Patch Antenna for WiMAX/ HIPER LAN/2 Applications ï¿½?ï¿½ï¿½?, International Journal on Recent Trends in Engineering & Technology [IJRTET], Volume 5, Issue 2, 2011. 7. Ch. Sulakshana and L. Anjaneyulu, ï¿½?ï¿½ï¿½? A CPW fed E-shaped Reconfigurable Antenna with Frequency Diversity ï¿½?ï¿½ï¿½?, International Journal of Information and Electronics Engineering, Vol 2, No. 2, pp 174-178, March 2012. 1. G.S.MANI, N.GUPTA, K.P.M.BHAT, L.ANJANEYULU,U.R.DESHMUKH : "S- band Instrumentation Radar for Back scatter measurements", Proc. Conference on Clutter characterisation, Aeronautical Society of India (AeSI) and IEEE (Bangalore branch), March 1994, pp 13-29. 2. K.P.M.BHAT, L.ANJANEYULU, L.SALA : "Flexibility in clutter measurement system through microprocessor based transceiver controller', Proc. National Symposium on Antennas & Propagation, Cochin University of Science & Technology, Cochin, Nov'94, pp 43-47. 3. M.V.Raghunadh, L.Anjaneyulu, N.S.Murthy : ï¿½?ï¿½ï¿½?Radar Emitter Identifications Techniques ï¿½?ï¿½ï¿½?, Proc. Conference on Trends and Techniques in Information Technology, IETE & CSI Gwalor, March 2001, pp 223-230. 4 L. Anjaneyulu, N.S. Murthy, N.V.S.N. Sarma : ï¿½?ï¿½ï¿½?Neural Network Based Radar Emitter Identifierï¿½?ï¿½ï¿½?ï¿½, Proceedings of the International Conference on Intelligent Systems 2005 (ICIS 2005), 1 ï¿½?ï¿½ï¿½?? 3 December 2005, University Technologi PETRONAS, Kuala Lumpur, Malaysia. 5. Swathi.G, Sriteja.Y,Satyajee.Ch, Anjaneyulu.L : ï¿½?ï¿½ï¿½? Design and implementation of a user friendly Firewallï¿½?ï¿½ï¿½? , "International Conference on Advanced Communications Systemsï¿½?ï¿½ï¿½? (ICACS-2007)- Jan 10. 6. L. Anjaneyulu : ï¿½?ï¿½ï¿½?Fuzzy Neural Network Based Radar Emitter Classifier ï¿½?ï¿½ï¿½?, Proceedings of the National Conference on Advanced Communication Technologies (ACT-06)-TEQIP, Andhra University, Visakhapatnam, Dec 8-9, 2006, pp 57-59. 7. L. Anjaneyulu, N.S. Murthy, N.V.S.N. Sarma : ï¿½?ï¿½ï¿½? Self organizing model Neural Networks based Radar Emitter classification techniquesï¿½?ï¿½ï¿½? , Proceedings of ï¿½?ï¿½ï¿½?International Conference on Radio Science (ICRS ï¿½?ï¿½ï¿½? ?2008)ï¿½?ï¿½ï¿½?, Feb 2008, Institute of Radio Science, Jodhpur. 8. L. Anjaneyulu, N.S. Murthy, N.V.S.N. Sarma., ï¿½?ï¿½ï¿½?Radar emitter classification using selforganising neural network modelsï¿½?ï¿½ï¿½?, Proceedings of the International Conference (IEEE) on Recent Advances In Microwave Theory And Applications (Microwave -08) , University of Rajasthan, Jaipur, November 21 ï¿½?ï¿½ï¿½?? 24, 2008. 10. L. Anjaneyulu, N.S. Murthy, N.V.S.N. Sarma., ï¿½?ï¿½ï¿½?Bi-spectral Analysis Technique for Identification of LPI Radar Signalsï¿½?ï¿½ï¿½?, Proceedings of the International conference (IEEE) on ï¿½?ï¿½ï¿½?Recent Advances in Communication Engineering (RACE-08), Osmania University, Hyderabad, Decemeber 20-23, 2008. 11. L. Anjaneyulu, N.S. Murthy, N.V.S.N. Sarma., ï¿½?ï¿½ï¿½?Identification of LPI Radar Signal Modulation using Bi-coherence Analysis and Artificial Neural Networks Techniquesï¿½?ï¿½ï¿½?, Proceedings of Fifteenth National Conference on Communications (NCC-09), IIT, Guwahati, 16-18, January 2009. 12. Ch. Sulakshana and L. Anjaneyulu, ï¿½?ï¿½ï¿½? A CPW fed E-shaped Reconfigurable Antenna with Frequency Diversity ï¿½?ï¿½ï¿½?,Proceedings of International Conference on Network Communication and Computer (ICNCC 2011), Pp 316-320, SRM University, New Delhi, March 21 - 23, 2011. 13. T.Venu Madhav, Prof.N.V.S.N Sarma and Dr.L.Anjaneyulu, ï¿½?ï¿½ï¿½? Maximizing Network Lifetime Through Varying Transmission Radii with Energy Efficient Cluster Routing Algorithm in Wireless Sensor Networksï¿½?ï¿½ï¿½?., Proceedings of International Conference on Network Communication and Computer (ICNCC 2011), Pp576-580, SRM University, New Delhi, March 21 - 23, 2011. 14. Ch. Sulakshana, L. Anjaneyulu, ï¿½?ï¿½ï¿½? A Compact CPW fed Circular Shaped Patch Antenna for WLAN Applicationsï¿½?ï¿½ï¿½?, Defence, Science and Research Conference (DSR -2011), 3-6 Aug 2011, National University of Singapore, Singapore. 15. T.Venu Madhav, Prof.N.V.S.N Sarma, L.Anjaneyulu, ï¿½?ï¿½ï¿½? Energy efficient cluster routing algorithm for wireless sensor networksï¿½?ï¿½ï¿½?, Proceedings of the International Conference on Communication and Broadband Networking (ICCBN-2011), pp 905-910, June 17-19,2011, Kuala Lumpur, Malaysia. 16. Ch. Sulakshana, L. Anjaneyulu, ï¿½?ï¿½ï¿½?A Compact CPW fed Patch Antenna for 5.8GHz RFID Applicationï¿½?ï¿½ï¿½?, International Conference on ï¿½?ï¿½ï¿½?Applied Electromagnetics" AEMCï¿½?ï¿½ï¿½?ï¿½2011 at Kolkata India, Dec 18-22, 2011 ( IEEE Digital Explorer. ISBN No: 978-1-4577-1457). 17. Ch. Sulakshana, L. Anjaneyulu, ï¿½?ï¿½ï¿½?A CPW fed H-Shaped Reconfigurable Patch Antennaï¿½?ï¿½ï¿½?, Indian Antenna Week Conference and Workshop on Advanced Antenna Technology, Dec 18-22, 2011. (IEEE Digital Explorer. ISBN No: 978-1-4577-1457). 19. V.Sudhakar, N.S.Murthy, L.Anjaneyulu, ï¿½?ï¿½ï¿½?Fully Parallel and Fully serial architecture for realization of high speed FIR Filters with FPGAï¿½?ï¿½ï¿½?ï¿½sï¿½?ï¿½ï¿½?, Published in International Conference on ï¿½?ï¿½ï¿½?Devices Circuits and Systemsï¿½?ï¿½ï¿½?, 15&16 March 2012, Karunya University, Coimbatore, India. 21. Ch. Sulakshana, L. Anjaneyulu, ï¿½?ï¿½ï¿½?A CPW fed Patch Antenna for Wideband Applicationsï¿½?ï¿½ï¿½?, Asia- Pacific Conference on Antennas and propagation, Singapore, August 27-29, 2012. 1. Area : Reconfigurable CPW fed patch antennas for WLAN applications (Completed). 2. Area : Under Water Communications(on-going). 3. Area : Design and development of under sea fiber optic instrumentation for military applications (on-going). STC on ï¿½?ï¿½ï¿½?IT Training Course for Police Personnelï¿½?ï¿½ï¿½? ï¿½?ï¿½ï¿½?IT Training Course for Rural Girl Studentsï¿½?ï¿½ï¿½? MHRD Summer School (Refresher Course ) on ï¿½?ï¿½ï¿½?Electromagnetics and RF Systemsï¿½?ï¿½ï¿½? MHRD Summer School ï¿½?ï¿½ï¿½? Data Communications & Networkingï¿½?ï¿½ï¿½? MHRD Summer School ï¿½?ï¿½ï¿½? Microwaveand Radar Engineeringï¿½?ï¿½ï¿½? ï¿½?ï¿½ï¿½?IT Training Course for Rural GirlStudentsï¿½?ï¿½ï¿½?